It’s a big year for one of the all-time great Aggie musicians. This month, alto saxophonist Lou Donaldson will receive the state of North Carolina’s highest civilian honor, the North Carolina Award. Previously, he was named a 2013 NEA Jazz Master, the nation’s highest jazz honor. 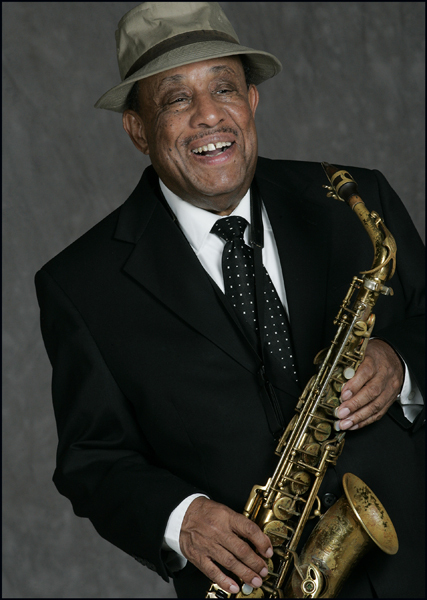 One of the most popular alto saxophonists to record for the famed Blue Note label, Stanly County native Lou Donaldson has played and recorded with jazz legends. He grew up in Badin, attended N.C. A&T State University, and was drafted into the Navy in 1945 where he played with the Great Lakes Navy Band. In the 1950s, several musicians were first recorded with Donaldson, including Horace Silver, Donald Byrd, and Curtis Fuller. He played with Art Blakely, Milt Jackson and Clark Terry, and on the milestone live recording, A Night at Birdland. His most successful albums are Blues Walk, Lush Life, and Alligator Bugaloo. He has toured in the U.S., Europe and Japan, and in 1996 was inducted into the International Jazz Hall of Fame, and was declared a 2013 Jazz Master by the National Endowment for the Arts. At 85-years-old, he still plays locally in New York where he lives. He and the five other honorees will receive their awards Tuesday October 30 at the North Carolina Museum of History in Raleigh. “Sweet Poppa Lou’s” very cool website is at http://loudonaldson.com/. This entry was posted in Creative Activity. Bookmark the permalink.